15. 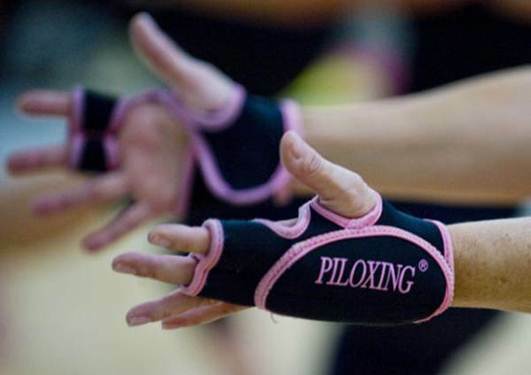 Get your Piloxing gloves on! We don’t know if Piloxing will be coming to our shores, but this blend of Pilates and kick-boxing, which is red-hot in Hollywood now, allows you to work on your core as well as get in a great cardio workout. Swedish professional dancer, Pilates instructor and bodybuilder Viveca Jensen designed Piloxing – it’s apparently a favourite with Victoria’s Secret models and a bunch of celebs. And before you brush it off as a fad, keep those weighted gloves and core-centric sculpting in mind – it could well be very effective. This one looks like fun and we hope it will cross the ocean – Masala Bhangra is an exotic dance routine done to hypnotic Bhangra music. It’s high energy, and fitness guru Sarina Jain blends traditional Bhangra dance steps with Bollywood moves to bring you a sparkling cardio workout. Some of her moves can be seen in Slumdog Millionaire. Visit masaladance.com for more info. Get some digital encouragement with these fitness-focused and community-minded websites. If it’s motivation that you need, try strava.com, which is a bit like Foursquare for athletes. Join the community, upload your data from your GPS unit, and share the results with your online friends all over the world. You can compete and climb leaderboards, plus get a great overview of performance. PTontheNET is an online portal that gives access to the latest exercise and fitness info, as well as workouts and instructional videos. See ptonthenet.com for info. Carien du Plessis, runner, 38, political reporter, Johannesburg. “I haven’t given strength exercises much thought. But I’ve been doing ultra-distances for three years, and this had a way of showing up my weaknesses. A personal trainer gave me exercises to do with Rocket weight bags or sandbags, which work the abs and arms. It’s tough, but doing these exercises makes me feel like a super-action hero. Rachel Manyathi, winner of the 30th Golden Reef 100 Miler (160km) last year, 36, teacher, Johannesburg.